It's been a while since we've seen a Mesh branded laptop. The Edge M870CL Pro R is the company's latest 17-inch desktop replacement. The generic chassis and limited features won't be to everyone's tastes, but it does offer decent comfort at a competitive price. The 17-inch screen is large and, with its 1440 x 900-pixel resolution, provides great detail for watching movies on. Colour reproduction is also good, although the glossy Super-TFT screen coating leads to distracting reflections in bright light. 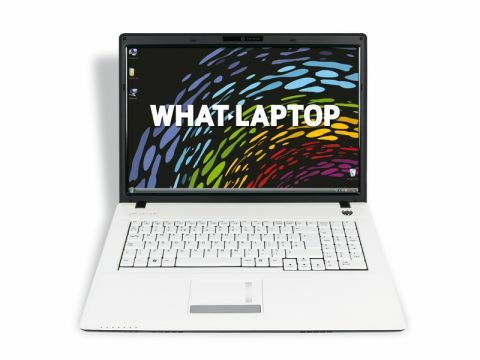 As with other laptop manufacturers, such as PC Nextday, a generic chassis has been used to cut costs. The bright white plastic is hard and attractive enough, but it is difficult to keep clean, with dirt and grime quickly showing up. Three handy hotkeys give you quick access to your web browser, email and volume mute. The keyboard is top notch. Large, tapered keys provide a fast typing action which is very accurate and ultimately a joy to use. The inclusion of a dedicated numeric keypad is also welcome and will benefit those who work with numbers or play games. With a battery life of only 121 minutes we'd expect performance to be impressive, but this is not the case. We actually saw this laptop outperformed by several similarly-priced laptops. This is unexpected, as the 2.53GHz Intel Core 2 Duo processor is at the faster end of the spectrum and the 4GB of memory should ensure plenty of power. Nevertheless, multi-tasking office applications proved no problem, but you may struggle to carry out more intensive multimedia tasks on a regular basis. The 320GB hard drive provides plenty of storage space for all your files, folders and media libraries. Uncommonly, it spins at 7200rpm rather than 5400rpm, providing faster access to your data. Connectivity is lacking somewhat. This laptop only features the older 802.11g Wi-Fi which isn't as fast as 802.11n technology that is now standardised. The 10/100 Ethernet adapter also provides slower fixed networking than Gigabit technology. We'd expect more than three USB ports on a machine of this size, and the lack of an HDMI out port, despite the inclusion of a VGA connection, also means you won't be able to output digital or high-definition content to an external monitor. We were a little disappointed by the Mesh Edge M870CL Pro R. It's got a low price tag but, despite being a comfortable option, is seriously lacking in features. For a little extra money, you can get a lot more.